"Customer is King", a globally popular phrase holds true for every business irrespective of its domain, size and market presence. Although it's quite challenging, but still each business ensures to utilize the best available resources and technologies to enhance as well as retain its customers. Determining the mood, likes and dislikes of the people has been one of the most effective and proven customer retention methods for many years. Previously, businesses would determine it using the traditional methods such as Direct Interaction, Mail Conversation and Marketing Survey. In this technology dominating modern era, the methods to determine the taste of customers have become more reliable and result oriented. 'Social Media Profiling' is a contemporary method which is in trend nowdays. The growing popularity of social media platforms like Facebook, Twitter, Instagram and Snapchat led to the invention of this unique technique. It is basically a method of tracking people's behavior and mood by following the content they post on social media platforms. Its result producing capabilities in a short span of time has raised the eyebrows of many businessmen who would use social media only for marketing and advertisement. Now-a-days, there are several data analytics companies exist in the market which provide professionally driven 'Social Media Profiling' service. Let's see, how does 'Social Media Profiling' go a long way in retaining the customers? The technique helps to determine the most appropriate time to talk to the customer. Whether the customer care executive attendes a call or puts it on hold could depend on the last Facebook post, tweet or Instagram picture shared by the customer. In this way, businesses can avoid losing a customer for sure. It also contributes to decide the right tone of conversation with the customers. Through profiling, you can easily predict the mood of the customer and can use the most suitable tone to talk. If the customer has posted jovial or funny post on his / her wall, the executive is advised to talk in friendly tone. Suppose you run a media house which produces Daily Soap and short Ads. Due to some reason, they are unable to keep-up the expectations of the audience, and are failing badly. Now, it's vital to determine the root cause of the problem to find a concrete resolution. 'Social Media Profiling' can do the trick here !! Using this technique, professionals put the conversation of the audience about the show on track, for a certain period of time. It helps to determine the cause of failure through analyzing the opinion of the mass. Once the business recognizes the mood and interest of the customers through Social Media Profiling, it becomes easier to customize the scheme & offers accordingly. Customized marketing is mainly practiced in retail and banking sectors. For a movie buff, they include a free movie ticket in their plan. And, for someone who travels a lot across multiple destinies, they include a handsome discount in their scheme. This proven technique has completely changed the ways businesses would use to retain their clients in the past. Mobile phones are no longer only a communication device; they have emerged to be complete fun and entertainment device with inbuilt games, music, camera etc. Mobile game development is no longer a niche and restricted territory. Each day, mobile game developers are churning out ever interesting and interactive applications. Be it iPhone games or for other handsets, these entertainment apps have come a long way since the first game Snake made its debut in the 1997. With increase in the processing capabilities of mobile phone, mobile gaming has grown leaps and bounds. One of the emerging trends in the mobile industry is the java games. These days, such apps are being released with multiplayer options with some going 3D, which is being touted as the benchmark of future games. Mobile gaming has thus become a multi-billion dollar industry. Gone are those days when mobile gaming meant a few fun apps installed in the handset. UNITY– Unity is an integrated authoring tool for creating 3D video games or other interactive content such as architectural visualizations or real-time 3D animations. It can be used for the iPhone games as well as other platforms such as Google Android. Maya– A favorite with developers around the world. Originally used for films, television and PC games it has made inroads into the mobile gaming industry as well. This platform is known for generating awesome 3D assets for games. Blender Game Engine– This is an open-source comprehensive 3D production suite, used for making real-time interactive content. It has been written from scratch in C++ as a mostly independent component, and includes support for features such as Python scripting and OpenAL 3D sound. It can be used to create online puzzles. Flash Lite– Flash Lite allows users to view multimedia content. It is nothing but a lighter version of Flash mainly targets mobile devices with heavy graphic processing capabilities. Flash games can be made compatible for the mobile platform using Flash Lite. When your requirement is of the classiest mobile games, the industry has ever seen, you have got to visit http://www.evontech.com/mobile-development.html. As I drive through town earlier I saw a sign for a local monogram shop and a banner that said "Find us on Facebook". Although I do not know the owners I was very proud of them (and I might add I am a fan of their page on Facebook). That really made me start thinking about the retail industry and social media – How can a local retail store or local service provider find success with social media? I must say I have several friends that own retail stores and can not seem to wrap their minds around how beneficial social media can be for them. It seems to me that the problem is that as a retail business owner you are focused on closing the sale when someone walks into your store. Building a relationship with that person to get them to buy later is a secondary issue. Not that this is bad, this is the way it has been done for a very long time. I know, I was raised in my grandfathers grocery store. Can a retail store make sales on social media? Yes, but that should not be the main focus. Before I go on you may be wondering how a retail store can make a sale on social media – you could have a products page on your Facebook Page Fan which shows items and has a tweet about new items and include a link to your website where they can order, you could post videos to YouTube of your products with your website address at the bottom of the screen. It is important to understand that people (your potential customers) do not join social media sites to spend money. They are there to reconnect with old friends and family, make new friends, research products and get recommendations from their friends and family. They are not there to be sold and they will quickly block you or delete you if they feel like that is your main objective. So knowing this, how can a retail business benefit? You must focus on building a relationship! People need to know you, then they start to like you, then hopefully they will start to trust you and at that point, once they trust you, they will buy from you. They are then referred to as qualified buyers. They have already made up their mind that you are a good person for them to do business with. Top 3 things to do or not do with social media! 1. Add value to their life – You can do this by sharing valuable information. Not just about your products or services but about things related to your industry. Let's say for example that you own that monogram shop I was talking about – maybe you can find articles or videos about babies or weddings or back to school that would add value to your potential customers life. Not necessarily about monogramming but if it was that would be helpful. 2. Use social media to build your leading authority (expert) status – People prefer to buy from those they think are experts in their field. How can you do this? You could blog and post your blog entries on Twitter, Facebook, LinkedIn and any of the many other sites. You could make videos and post them to YouTube and then to all the other sites. You could write a short book or ebook about your industry. 3. Do not try to sell to them – do things to move your relationship off of the social media sites to sell. Offer them something for free to opt-in to your email list. Yes retail stores should have a mailing list. Post your blog entries so that they will visit your website and once there check out your products and services. Create contests or challenges to get them involved with you off of the social media sites. Social media sites offer you, as the retail business owner, the ability to expand globally. The number of people on them at any one time is staggering. Do yourself a favor and pay attention to what is going on in the world of social media. In today’s time and age, smartphones and applications have gained a lot of popularity. As of now, a mobile phone is not just restricted to make calls. With the help of mobile phone development, individuals and businesses have started creating unique and innovative applications, which facilitate internet browsing, email, faxing, games, graphics and wireless information services. Considering the revolution with handheld devices, mobile application developers are in rage. Mobile application developers combine different elements to formulate software apps and solutions. Various organizations have started showing interest in business applications and loads of them have started outsourcing their requirements to developers across the globe. A few preferred mobile software solutions include web applications, games and interactive business solutions across different technology platforms. There are a few things you need to consider, before you decide on a specific mobile application. Mobile phone applications are different from one platform to another and one cannot devise an application that runs on all platforms. With different companies, the mobile phone platforms are dissimilar and certain applications work with specified technologies only. For an example, an iPhone application cannot work on a Windows Mobile or a Blackberry platform. Therefore, it is imperative to select the ideal mobile platform, before you get started with mobile apps development. Before you get started with a mobile application developer, you must determine the kind of audience you wish to target at. Based on your target audience, you must then decide whether you want applications that could be used by individual consumers or business mobile applications. It would be easier for the mobile application developer to form a work plan, plan on the design and the technology for your mobile software. Wireless applications have revolutionized the way cell phones are being used today. Businesses are now getting interesting apps, which are innovative and unique. The whole purpose of mobile application development is to strike a chord amongst the customers. Businesses require powerful mobile phone applications, which serve a variety of purposes including browsing, gaming, entertainment, search and many more. Mobile application developers can design, create and customize the application in accordance to the client needs. These are professionals who possess the technical as well as the functional expertise to perform simple and complicated tasks. To conclude with, one can access the world with any handheld device today. Today, the most booming and most progressive industry can be the market of mobile application development companies. This fact can be caught on the importance of every mobile technology that is in demand in market is growing rapidly. As the fast usage of mobile devices, there are number of business organizations who are talking interest in developing and investing in designing the apps. Some years back, the companies were just hiring the industry professional and software engineers for research and development of apps and for marketing them as well. For more smarter phones, and computer tablets which are coming in the market the requirement for developing the applications are also getting increased. Developing and marketing the apps for smart phones and tablets is completely dynamic platform for any software development companies. Developing the apps for smart phones can surely enhance to put more and more creative ideas into existence. There are many such mobile operating systems platforms that are available and are among the competition with web service provider are increasing day by day. But at the end of it, consumers are always in profit. These application development experts are providing us the complete set of amazing apps for their clients all over the world. These were some growing areas for creating apps. Apart from these there are many app companies to provide more creative app other than categories mentioned above. If the developer is having an idea to create an app on the basis of any we service provider companies which are providing dedicated mobile apps services to their clients. According to their needs and requirements the apps can also be customized. Smartphones are a huge success story of the past two decades – and the devices get more powerful each year. Many businesses achieve significant benefits by using mobile technology – including those in both industrial and commercial markets. Deploying applications to mobile users involves a unique set of challenges and choices. This article provides a background on the current mobile technologies available. The fundamental consideration with delivering business applications over mobile phones is the huge number of devices, and the wide variety of features on these. Successful mobile application development often involves a combination of technologies and techniques. This is where a diverse skill set, together with an understanding of the mobile landscape, is essential to provide businesses not only with development services but also effective guidance in this time of accelerating change. The challenges at this stage in mobile technology are mirrored by an ever-increasing range of opportunities for businesses to implement new and improved processes. The mobile Web has undergone enormous advances over the past few years. According to recent research, around a third of adults in the UK are now using a smartphone – it seems fairly safe to assume that this will only continue to increase. Many more mobile users have some kind of internet access. Although the functionality of mobile Web browsers is now at a good level, there are still considerable restrictions in terms of network connectivity and speed – this is expected to improve over the next couple of years as 4G kicks in, but for the moment remains a serious constraint. Many organisations create mobile versions of their sites and Web services, with minimised content designed to cope with mobile hardware and data connectivity limitations. One potentially valuable prospect in the mobile Web will be the advance of HTML5. This technology is still very much under development, but with major sites such as the Financial Times opting to use it rather than targeting specific mobile platforms it does look very promising. HTML5 offers a range of benefits including facilities for offline support, multi-media, interactivity and location awareness. Native mobile applications are software solutions deployed directly onto devices such as phones. Many mobile applications link to internet services, with the application, or “app”, handling user interaction natively. Mobile apps have the advantage that they provide a deep level of interactivity that is suited to device hardware – for example, using gestures or sensors like GPS. The difficulty with using mobile applications to deliver business services is the range of platforms in operation. As of early 2011, Google, Apple and RIM together occupy around 90% of the smartphone market. However, the mobile landscape is still in a state of change and there are other players including Windows and Palm – it would be unwise to make any predictions about how market share will look even in a matter of months as things stand. Microsoft have replaced the Windows Mobile system with Windows Phone 7, with an increased focus on consumer use. Although Microsoft currently has a reduced position in terms of smartphone market share, the upcoming Mango release is looking very promising, and is being received quite well in early testing. In terms of technologies for mobile apps, the list is long, and depends on which platform (or platforms) you choose to target. Among the most commonly used programming languages for mobile applications are Java, Objective C and C++. Each of the major platforms has a specific Software Development kit, with its own tools to help with the design, testing, debugging and deployment. The complexity of mobile application development is such that targeting even a single platform involves extensive testing. Some businesses maximise on development resources by balancing native user interaction with cross-platform resources at the back-end, in which case a mobile app can effectively function as an interface for a Web application. Aside from targeting specific mobile platforms through software and Web development, there are additional ways to exploit mobile contexts for some business processes – SMS is one such case. In this model, services are delivered as SMS text messages. This has the benefit of generally working across all phones, and payment can be handled via users bills – but it’s a very limited form of interaction. SMS also has a problem that message delivery is not guaranteed. Integrating SMS message handling into Web applications is quite simple – and support for processing SMS messages from users is widely available. Google’s Android operating system is going from strength to strength at the moment. Having initially been seen as a platform of interest mainly to geeks, Android now occupies around a third of smartphone market share. Android’s growth is partly down to the openness of the platform, which is available on phones across the market range and from various hardware manufacturers, making it accessible to a more diverse range of users than iPhone. Apps available through the Android Market are also subject to very little control, which produces a great deal of variety and flexibility but naturally results in a higher proportion of poor quality applications in circulation. Google’s approach is the opposite of Apple – which retains significant control over its mobile phone operating system. Google’s initial idea was to make a new phone operating system which would be open and free. Their hope was that this would encourage innovative development of both phones and applications. Google has invested in Android because it expected that Web searches would increasingly happen on mobiles, and it wanted to be able to advertise to mobile users. The iPhone was of course in a dominant position as the advance of the smartphone took shape, and the platform is still in a very powerful place. Although business users naturally tended toward Blackberry in the past, both iPhone and Android have continued to make considerable headway for enterprise as well as consumer use, while Blackberry has started catering more to the consumer user as well. The result is that all three of the major smartphone platforms are now occupying some of the same space. The iPhone offers support for external business utilities such as Microsoft Exchange and, unlike Android, iPhone apps are subject to serious vetting before users can deploy them. The natural downside to this increased level of control over the platform as a whole is a lack of flexibility, but for business applications the plus side is a very high guarantee of quality and reliability for the end user – and ultimately for any business processes being implemented through the technology. With the hugely popular visual designs and interaction models the brand is famous for, the iPhone is certainly an attractive platform for commercial applications. Apple have been responsible for developing innovative features whose success has prompted other platforms to emulate them, such as multi-touch interaction. Apple does not permit users to directly install applications onto the iPhone – all applications must be bought from the Apple Store, and Apple takes a 30% cut. There may be some way around this in the future, but at present we are not aware of it. For certain applications the fragility, financial value and battery life of the iPhone may pose problems. Of course, these obstacles apply mostly to commercial / industrial applications. They are not particularly a problem in terms of creating end-user applications. Blueberry has the Objective C skills necessary to develop iPhone programs, and we would be very interested in discussing this with customers. Although iPhone has lost considerable smartphone ground to both Blackberry and Android, it is generally still seen as the platform to beat, and continues to be a market leader in many ways. RIM’s Blackberry platform was long regarded as the mobile system of choice for business and professional users, a perception that still persists to a certain degree. Over the past few years Blackberry has also made significant advances in the consumer market, introducing handsets that have proven especially popular among young smartphone users. Like Android, Blackberry hardware is very varied, so users can access mobile sites and applications via differing screen sizes and controls – increasing the complexity in any development project. The Blackberry platform delivers a wealth of enterprise services as standard, with Blackberry Enterprise Server seen as a major asset for corporate users. Email on Blackberry is particularly strong, so users who are dependent on a high level of security and reliability in messaging (and communications in general) naturally tend towards this platform. While iPhones are focused on touchscreen interaction, as are Android devices to a slightly lesser degree, Blackberry handsets are most likely to provide hardware keyboards for text input. This can be a key aspect in the potential of the platform for certain application categories. Native apps can be deployed through the Blackberry App World marketplace, which has, to date, not occupied as central a role for users as the app stores on iPhone and Android, although the brand is clearly focusing extensive efforts on developing this aspect of usage. Windows Mobile and Windows Phone 7 represent Microsoft’s foray into the mobile world, which has enjoyed varying degrees of success in the consumer and industrial markets. From the consumer point of view, at the moment some of the high end smartphone brands such as HTC and LG are producing handsets with the Windows Phone operating system deployed on them, with networks including O2 and Orange providing mobile services. Nokia and Windows have reached a major deal in which the manufacturer is dropping its Symbian platform entirely to focus on Windows as its operating system of choice. In 2011, Microsoft is due to release a major new version of the mobile Windows platform named Mango. This much anticipated release could alter the position of Microsoft drastically within the mobile world, partly on account of the Nokia partnership and partly since the system is set to include a number of new features such as increased support for HTML5. At the same time, Windows Mobile has also been adopted strongly by manufacturers of industrial PDAs and mobiles – portable computing device products designed for commercial rather than consumer use. This has seen Microsoft exploring various industrial contexts for mobile processing, with Windows Mobile 6.5 particularly successful in such environments, and hardware produced by various manufacturers including Motorola. Windows Mobile is therefore a natural choice for many mobile workplace needs, including warehouse and delivery services. From a development perspective, Windows Mobile has very strong advantages. Microsoft has provided a rich platform of development tools – including the C# language, which is much easier to use than C used on other mobiles. Microsoft also includes tools for communication between software on the phone and central servers, and they even include a small database engine. The strong development tools and wide availability of different devices make Windows Mobile a particularly valuable platform for delivering business applications. At Blueberry we have a uniquely high level of expertise on Windows Mobile systems, so are well positioned to deliver solutions on this platform. Blueberry Consultants ( http://www.bbconsult.co.uk ) has the development skills to build and deploy applications targeted at any of the mobile platforms and hardware manufacturers in use today, having developed a diverse range of mobile projects, including many on Windows. The team is also well placed to provide tailored approaches involving multiple technologies and programming languages where necessary. With our skills in Web and client-server development, we can design a complete system that integrates field staff and office workers. Whatever your business process or context, Blueberry has the expertise to provide bespoke, comprehensive solutions to mobile integration, enhancing not only communication but also efficiency and productivity. In today’s modern world where almost everybody never leaves home without their trusty tablets and smart phones, mobile application development has definitely become a gold mine. After all, one of the perks of owning a hand-held internet-connected device is the ability to download any app you choose, whether it’s one that locates the best restaurants in town or an app that lets you shop online. If you run a company or business then you should know that mobile application development is now essential to the success of any product or service. An awesome app that can be downloaded by your target customers can increase your exposure and sales. If you happen to be trying your hand at mobile application to development to design your own application, then you should know what makes a great mobile application. However, even if you don’t have the time, knowledge or the skills to create a great app, you can always hire a team of mobile app developers. In case you do, make sure you keep these tips in mind to ensure that you are hiring the right experts. • Choose developers that own and are familiar with a wide range of devices. Before you start looking for mobile app developers, you should already have an idea about what kind of devices you want your app to be compatible with. You’ll probably want to target common smartphones such as Blackberries, Android and the iPhone. Naturally, you should choose mobile application developers that own and are familiar these devices. They should also play or use a wide range of apps on these phones on a regular basis. • Ask for a list of former clients and created apps. Naturally, you will want mobile app developers that have had plenty of experience and created apps under their belt. So make sure you ask for references as well as a list of apps that the developer has created. When checking the apps, keep several questions in mind. Is the applications easy to use or does it require a lot of techie knowledge? Does the app work offline or can you still use it without internet connection? Does the app look polished and professional or does it resemble something that a sixth-grader designed? • Avoid apps that are one-size-fits-all. When choosing mobile app developers, choose those that are able to tailor your app in order to fit a variety of mobile gadgets. Your app should be able to perform well for users of iPhones and users of Android. • Know how you can make money with your mobile. Mobile application development can be a lucrative venture so if you’re looking to make money off your application idea, then your mobile app developers should know how to incorporate this idea into the app. Will users be charged in order to download the app? In case the app is free, what kind of in-app purchases can you use? • Look for mobile app developers that offer extra services. Ideally, you should also look for an app developer who can offer services beyond designing the app. Ask developers if they also offer security features and marketing services. Why Use NodeJS with JSON? NodeJS is used with MongoDB in order to create a web standards architecture or RESTful API; NodeJS is a lightweight framework that handles parsing of information between the client side and the server, and ReactNative can be layered on top of NodeJS in order to create the user interface. NodeJS handles a lot of queries and handles them in a very fast way, which makes its ideal for mobile application development. A RESTful application programming interface is a method for handling HTTP requests and updating databases. JSON and NodeJS are very efficient ways to handle AJAX type requests. Facebook announced plans in January 2018 to adjust personal News Feeds away from Facebook pages and brand pages, to focus more on what it touts as “meaningful interactions with friends and family”. Whatever, Mark. What does this mean for Facebook pages and their owners? This shift hints at a dismal future for media, brands and publishers who rely on Facebook as a platform for reaching customers and targeted audiences. January’s announcement has even resulted in some companies to shutdown from the crushing loss of web and social traffic, thanks to Facebook’s “thoughtful” algorithm change. As fewer Facebook pages appear from your News Feed, with more baby photos and snarky posts from your friends replacing them, one simple step you can take will ensure that you still can see posts from your favorite local small businesses, brands, media outlets, and Kardashians. Hallelujah! Hover over the Following button and select See First. Launch the Facebook mobile app on your iPhone, iPad or Android device. 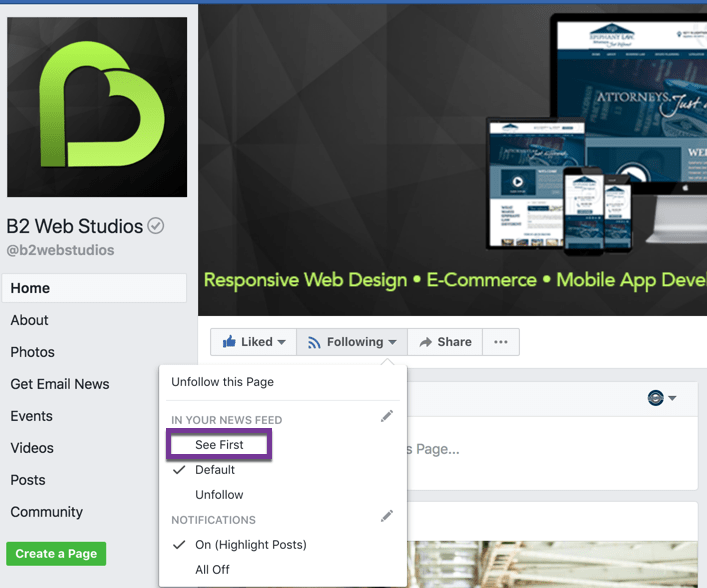 Go to the Facebook page (like B2 Web Studios) you want to make sure you see in your feed. Under In your newsfeed, select See First. Besides using these helpful steps for your favorite Facebook pages, you can actually do this for your Facebook friends also – Simply go to a friend’s Facebook profile page and follow the exact steps above to prioritize certain friends’ posts over everything else in your News feed. 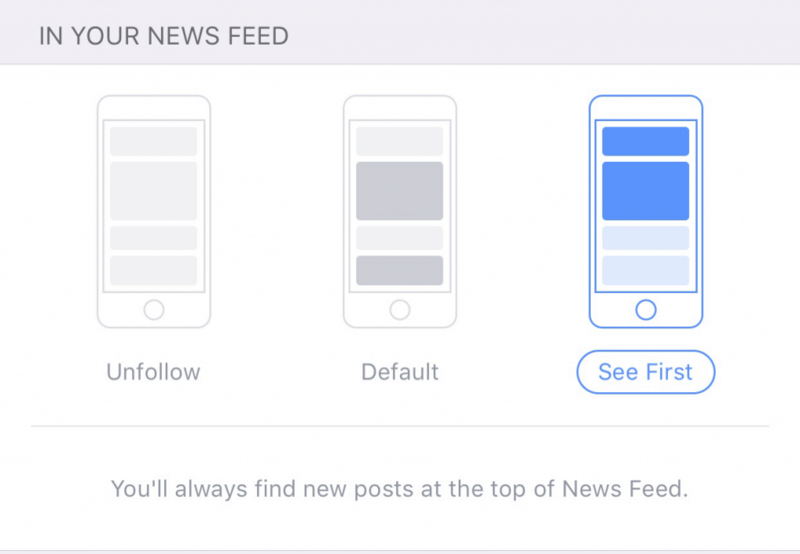 To see less from certain friends or Facebook pages, you’re able to (mercifully) either temporarily or permanently stop having their posts appear in your feed without unliking or unfriending them. 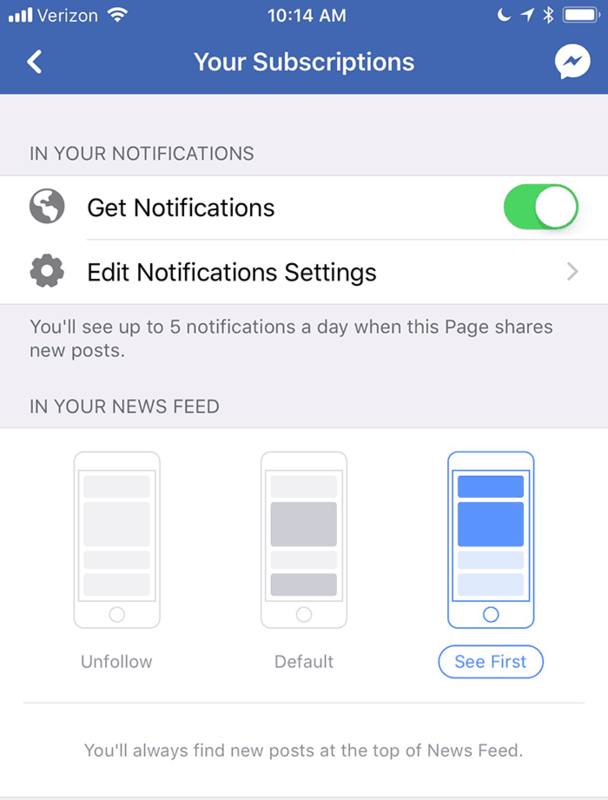 To prevent friends or Facebook pages from becoming a permanent fixture in your News feed, you can either snooze that page or friend for 30 days or unfollow them completely.